Homeowner’s insurance policies provide coverage for a wide range of “occurrences,” including: fires, collapsing roofs, water damage from burst pipes, and other incidents which require thousands of dollars to remediate. If the homeowner’s insurance company believes it has paid on a claim where the occurrence was caused by the negligence of a contractor, it will “subrogate” to the right of its insured and sue that contractor directly. It is important to take such subrogation suits seriously, but to also understand that they can be successfully defended. The Raleigh construction litigation attorneys of Maginnis Law represent a wide range of contractors and can assist you in defending a subrogation action brought by a homeowner’s insurance company. To speak with one of our Raleigh attorneys, call the firm at 919.480.8526 or 919.526.0450. Subrogation is a legal principle that permits an insurer that has rightfully paid damages to its insured under its policy to recover those funds from another party that is primarily liable for the damages. For example, assume that the John and Jessica have purchased homeowner’s insurance from Insurance Company A. John and Jessica hire a contractor, The Plumbing Guy, to perform plumbing work on their newly remodeled kitchen. Then, several months down the road, the kitchen sink explodes and sends water all over the floor. Insurance Company A subsequently has to pay $20,000.00 to clean up the mess. 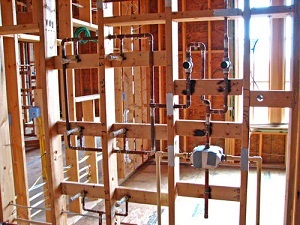 If Insurance Company A believes the water damage was caused by The Plumbing Guy’s negligence, it may “subrogate” to John and Jessica’s negligence claim against The Plumbing Guy and sue the contractor directly as subrogees of John and Jessica. Most insurance attorneys handling subrogation claims file dozens at a time and handle them in volume. It is not uncommon for our attorneys to see many of the Defendants in these cases unrepresented. More often than not, these unrepresented Defendants fail to even show up to Court. In that situation, the insurance company’s attorney will simply obtain a “Default Judgment.” This allows them to essentially skip a trial and begin collection efforts. If your contracting business is incorporated, or is a limited liability company, the insurance company would be able to immediately start collection efforts with the Sheriff after obtaining a Default Judgment. This means that the Sheriff would seize and auction your assets. Therefore, it is important that you retain counsel to defend any subrogation claim. In some cases, our attorneys may be able to assist you in completely defeating recovery by the insurance company. In others, we may reach a settlement for only a portion of the amount claimed by the insurance company. The outcome, of course, depends upon the exact facts of your case. Maginnis Law’s Raleigh subrogation attorneys provide free consultations to subcontractors and general contractors being sued by an insurer. We offer hourly and flat rate billing arrangements to fit your business’ needs. Our firm handles cases throughout North Carolina, including Raleigh, Durham, Cary, Chapel Hill, Apex, Fayetteville, Greensboro, Pittsboro, Charlotte, and Sanford. To speak with a Raleigh lawyer regarding your subrogation case, call the firm at 919.480.8526 or 919.526.0450 or send a confidential email using our contact page.